Enjoy the latest TM promo that gives you unlimited texting to all your friends within the same network and Globe. It only cost you 10 pesos for a 2 days text all you can and the good thing is you can add up a 15 minutes call for only 5 pesos. Sounds cool? Yes, if you’re a prepaid subscriber on this network then try this out and tell your friends how to register on this promo. Mechanics is just simple, please follow the given instructions below. 1. You need P10 regular load on your prepaid account. 2. 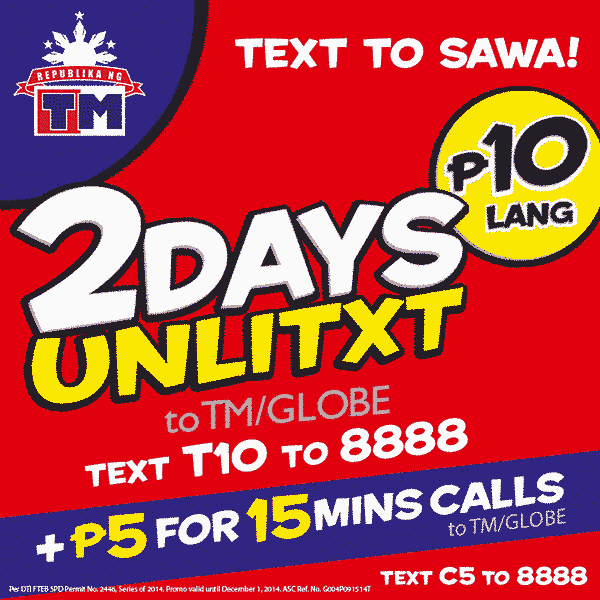 Just text T10 then send it to 8888. If you want to add up 15 minutes call along with promo, all you need is to reload an additional P5 load on your account then text the code below. 1. Add P5 regular load on your TM sim. 2. Then text C5 to 8888. Note that you will receive a notifications confirmation that you are already registered on this promo. For balance inquiry and other details you can also use *143#. Promo runs up to December 1, 2014. For updates and other concerns you can visit their website or call TM hotline. is T10 promo still available this year? ?